If you've never heard of JackJonesTV - fair enough. A lot of folk hadn't until a week ago. Jack Jones is a UK-based YouTuber with a modest 260k subscribers, who creates 'prank' videos. These videos often consist of Jones recording himself saying or doing something obnoxious or insulting to an unsuspecting member of the public. Last week, Jones uploaded a video of him approaching 18 year old Owen Trett, asking him he'd like to go on a date. After an awkward exchange, the video came to a close after a friend of Trett's eventually told Jones that he 'wasn't very funny'. The video was subject to criticism online, calling Jones a bully and telling him that the video was bad. Trett made his own video in response explaining what happened before and after the video, and went on to share his opinion about Jones and his style of videos. In the video, he urges viewers to not endorse this kind of behaviour. The video circulated the internet and other YouTubers spoke out about it, before it ended up in the hands of YouTube drama extraordinaire, Keemstar. 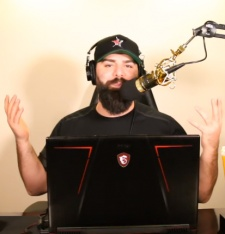 While Keem usually only discusses big YouTube stars, this particular story caught his interest. Keemstar spoke about the incident in a recent episode of 'Drama Alert' where he then called Jones out for his bad content and encouraged his fanbase of 3 million to subscribe to Trett's channel instead. As a result of that, Trett's channel shot from 128 subscribers to over 6000 in less than a day. That's some powerful influence. Today, Jones responded to the ordeal on his Intagram story, stating that he pulls pranks like this every day and no one has had a problem with it so far. This compilation of Jones being punched by different people may suggest otherwise. This type of content is reasonably common, and 'prank videos' are still very popular on YouTube. It's not against the law in the UK to record someone in a public area. What seemed to anger people was how uncomfortable Jones' actions made the group of people he was talking to. He didn't ask their permission to record, or their permission to post the video afterwards.